Start off your visit on the 20th (Sat): pick up a one of a kind souvenir at abacanto home, make a trip to Torri degli Asinelli e Garisenda, then make a trip to Piazza Maggiore, then look for gifts at La pentola del te, and finally browse the collection at Biblioteca Salaborsa. On the 21st (Sun), you'll have a packed day of sightseeing: take in the spiritual surroundings of Basilica - Santuario di Santo Stefano, head outdoors with Monte delle Formiche, and then admire the striking features of Fontana del Nettuno. For where to stay, other places to visit, traveler tips, and other tourist information, read our Bologna vacation trip planner. Manila, Philippines to Bologna is an approximately 27-hour combination of car and flight. The time zone difference moving from Philippines Time to Central European Time is minus 7 hours. Traveling from Manila in May, things will get much colder in Bologna: highs are around 27°C and lows about 14°C. Finish your sightseeing early on the 22nd (Mon) so you can take a train to Florence. Explore hidden gems such as Cathedral of Santa Maria del Fiore and Piazza del Duomo. There's much more to do: see the interesting displays at Uffizi Gallery, let your taste buds guide you at a local gastronomic tour, get to know the fascinating history of Piazza della Signoria, and take in panoramic vistas at Campanile di Giotto. To see reviews, maps, where to stay, and other tourist information, you can read our Florence travel planner. Take a train from Bologna to Florence in an hour. Alternatively, you can take a bus; or drive. In May, daily temperatures in Florence can reach 28°C, while at night they dip to 13°C. Wrap up your sightseeing on the 26th (Fri) early enough to travel to Fira. Eschew the tourist crowds and head to Sunset in Oia and Perissa Black Sand Beach. There's lots more to do: hike along Hiking Trail Fira - Oia, explore the ancient world of Akrotiri, explore the activities along Amoudi Bay, and take an exotic tour of a safari tour. To find maps, more things to do, reviews, and other tourist information, read our Fira vacation trip planner. Traveling by combination of bus and flight from Florence to Fira takes 5 hours. Alternatively, you can do a combination of car and ferry; or do a combination of train, bus, and ferry. The time zone difference when traveling from Florence to Fira is 1 hour. Expect somewhat warmer evenings in Fira when traveling from Florence in May, with lows around 20°C. Finish your sightseeing early on the 1st (Thu) to allow enough time to travel to Athens. Athens is known for historic sites, museums, sightseeing, shopping, and nightlife. 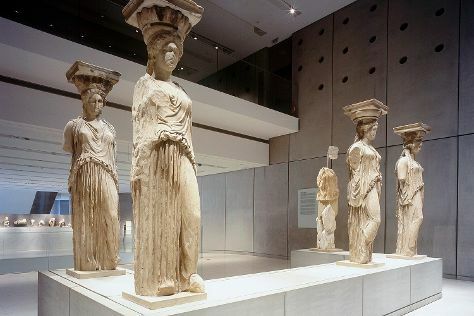 Your plan includes some of its best attractions: explore the ancient world of Acropolis of Athens, admire the masterpieces at Benaki Museum, appreciate the history behind Temple of Olympian Zeus, and take an in-depth tour of National Archaeological Museum. To see traveler tips, reviews, where to stay, and tourist information, use the Athens itinerary maker. Getting from Fira to Athens by combination of bus, flight, and subway takes about 4 hours. Other options: do a combination of ferry and taxi. Expect a bit warmer weather when traveling from Fira in June: highs in Athens hover around 36°C, while lows dip to 24°C. Wrap up your sightseeing on the 4th (Sun) early enough to travel back home.